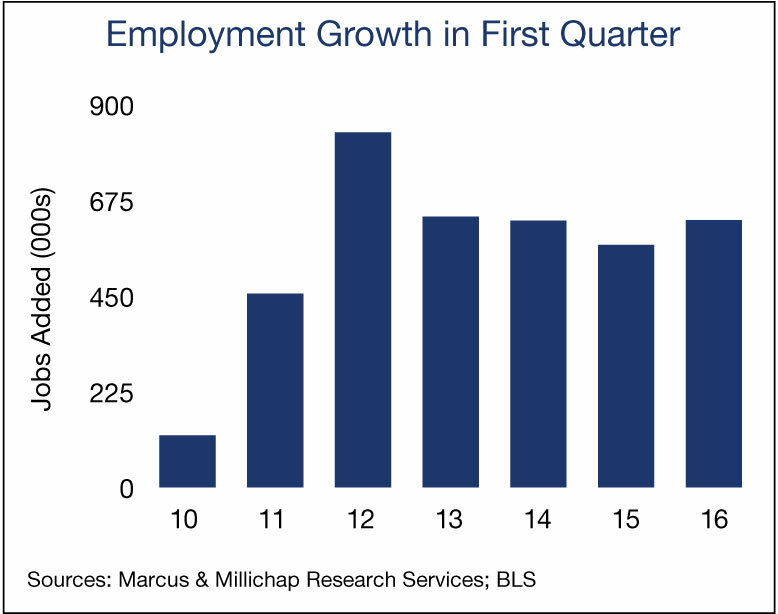 A solid burst of hiring last month culminated a strong first quarter for the U.S. labor market. Brushing off stock market volatility early in the year and softness in overseas economies, employers added 628,000 workers to payrolls in the first quarter, exceeding the total recorded in the first three months of 2015. Other labor market indicators, including an expansion in the labor force last month and a low level of initial unemployment claims, form a foundation to sustain a respectable pace of economic growth during 2016. The creation of new households by recent hires and spending from growing wages will also benefit commercial property sectors throughout the year. Private-sector establishments brought on 195,000 new workers in March to account for nearly all of the 215,000 positions created. Goods-producing industries languished during the month, but consistent employment gains and wage increases continue to support growth in consumer-oriented segments of the economy. Most conspicuously, retailer expansions accounted for most of the 51,000 trade positions added in March. Many of the new retail posts were likely created to staff retailers’ digital initiatives, with online retail sales continuing to grow at a faster tempo than store-based spending during the first quarter. Hospitality industries also grew last month. The changing dining habits of consumers supported a gain in bar and restaurant payrolls that represented more than half of the 40,000 new hires in leisure and hospitality in March. Job creation and a modest rise in the average hourly wage in the first quarter supported an increase in spending on retail goods and a range of services that include healthcare. Factoring in the positive contribution from consumers, the Atlanta Fed estimates the economy expanded at less than a 1-percent annual rate in the first three months of the year. The subdued rate of growth reflects softness in trade-based segments of the economy. The strong dollar will continue to suppress exports, which are part of the GDP calculation, and prevent the economy from attaining a higher rate of growth. Led by a gain in professional and business services payrolls, 109,000 office-using positions were added in the first three months of 2016. U.S. office vacancy declined to 15.1 percent last year, but tenants requiring larger workspaces will contribute to 87 million square feet of net absorption and an additional 30 basis point dip in vacancy during 2016. Retailers seeking to beef up their online presence and order fulfillment capability will lift the U.S. industrial property sector with new space requirements in 2016. Construction in the sector remains restrained, but new demand from retailers and expanding logistics providers will support a decline of 50 basis points in the national vacancy rate to 6 percent, the lowest level this century. This entry was written by marcusmillichap, posted on April 8, 2016 at 9:46 pm, filed under Uncategorized. Bookmark the permalink. Follow any comments here with the RSS feed for this post. Post a comment or leave a trackback: Trackback URL.